Our Solar space heating systems are an effective and excellent way to reduce costly energy bills during your heating season. How hot your attic gets during the days when your current heating system has been on. 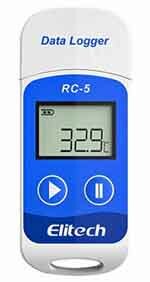 You can purchase an inexpensive Data Logger to place high in your attic which measures and records temperatures, one example is the Elitech RC-5 USB Data Logger available from Amazon. Even at low attic temperatures a solar space heating system can be far more efficient than your primary home heating system. The area you would first like to heat - the Attic Solar Space Heating System hot air outlet in your home is generally located in the lowest frequently occupied room in your home, it is better to heat a room at a low level because hot air rises to heat all your home. The Attic Heat Harvester controller (and the room temperature sensor) should generally be located in this room approximately 1.5m from the floor so the controller features can be easily accessed. It will be easier if the controller is located near a suitable 230vac electrical supply, from for example a nearby 13 amp socket. The controller internal connectors on the right side of the printed circuit board will be connected via cables to the attic Fan/Blower J8, the air valve J8, the attic J5, and room temperature J6 sensor cables. The hot air outlet vent should be fitted between 2 ceiling joists, with an air valve generally mounted immediately above. The air valve is automatically closed when the attic Heat Harvester is not operating stopping hot room air escaping into the attic. Which is the hottest side of your attic - this is often the direction of the sun around 1pm. The open attic end of the flexible duct (where the fan/blower will be fitted) should be close to this point and approximately 300-600mm (1 to 2 ft) below the attic apex where the attic air is hottest. The attic temperature cable sensor end will be fitted close to the fan / blower air entry point. The Attic Heat Harvester system components diagram shows the major system components, the wiring diagram shows the connection. The parts cost for the basic system is currently some £500. For the system to operate well the heated air needs to be able to move from the heated room into other areas of your home, in older homes it can often escape through gaps around doors and windows. However if your home is fairly air tight you can leave the home doors open or install gravity shutters that permit the heated air to move from the room that is initially heated throughout your home. You may also wish to install a second air valve in the upper hallway attic floor to enable the warmed air to re-circulate and be reheated – the AHH controller is capable of operating a number of compatible air valves. If your home is not a single storey you will also need to decide the route the 203 or 254 or 305 or 355 or 400mm insulated duct is going to take to pass through the upper storeys, through for example cupboards. Holes will be required in the floors in the upper storeys to pass the duct through. The size of the ducting and the fan / blower you decide to use depends on the size of your home. Large diameter fans, insulated ducts, gravity valves e.t.c. 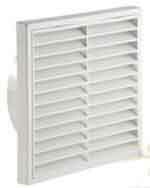 are preferred as they reduce fan back pressure and increase airflow. a) For small homes (total floor area approx. 70m²) we suggest using a 203mm (8inch) or 230mm (10 inch) diameter duct and fan. b) For medium sized homes (total floor area approx. 120m²) we suggest using a 230mm (9 inch) or 300mm (12 inch) diameter duct and fan. c) For large homes (total floor area approx. 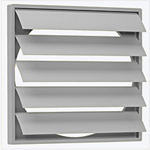 200m²) we suggest using a 300mm (12 inch) diameter duct and fan. Answers to the above questions will probably determine the best route that the insulated flexible duct will take. The duct length should ideally be minimized, and it’s path be as straight as possible, gentle bends are OK, but sharp bends will reduce the airflow which impairs the system efficiency. In order to get the best solution to the steps above you may have to compromise somewhat. When you have decided on the location of the system components you can determine the minimum length of the cables you will require, you will need these to choose the cable lengths to order. i) The insulated ducting – this may not be required if you have a 1 floor home and the attic is shallow as the fan can be fitted to the top of the air valve. Items a) through c) can only be obtained from Solar Heat Harvester. We can also supply items d) through h) but you may be able to obtain them less expensively and more conveniently elsewhere. d) a short length of twin and earth 1mm² cable from the main supply to the fused On Off switch. 1. The air valve, which can most easily be installed using a ceiling box that it fits, is generally fitted in the floor above the initially heated room. The insulted ducting will fit directly to the air valve and be secured using a jubilee clip. Air valves can be obtained that are 203mm, 254, 305, 355 or 400mm in diameter, Solar Heat Harvester stock some air valves. 3. Before finally deciding the position of the hole in the attic floor ensure that there is sufficient height, generally at least 1m, above the hole for the air valve (if you have a single storey home) and, if required any ducting bend. The insulated ducting should be as straight as possible to minimise fan back pressure which reduces fan air flow. 4. For multi-storeyed home holes will be required in the floors for the insulated ducting to pass through. 5. Fix the ceiling box to the ceiling where the air valve is to be sited, preferably to the ceiling joists. 6. Make a mounting plate for the fan / blower and fit it high in the attic ideally within 300 to 500mm from the roof apex on the most sunny side of the attic, the insulated ducting will fit to this. 7. The ducting, if required, goes from the top of the air valve to the fan unit. 8. The attic ducting may require to be supported to keep it as straight as possible, webbing loops can be fitted to the roof trusses as shown below. Minimize bends in the ducting as bends impair air flow and reduce the system efficiency. Long straight duct lengths to the fan can be supported by a narrow piece of wood beneath the ducting, supported by wide webbing. Gentle duct bends can be made using	flexible wood or plastic duct supports. 9. Securely mount the attic temperature sensor cable so that the sensor is near the centre of the fan inlet. 10. Connect the air valve cable to the air valve and the fan / blower cable to the fan and run them together with the attic temperature sensor cable back alongside the insulated ducting as required back of the controller location. 11. If you wish to hide controller system cables in walls make channels for them. Alternatively you can use self adhesive mini trunking (available from Screwfix for example) to enclose the cables. 12. 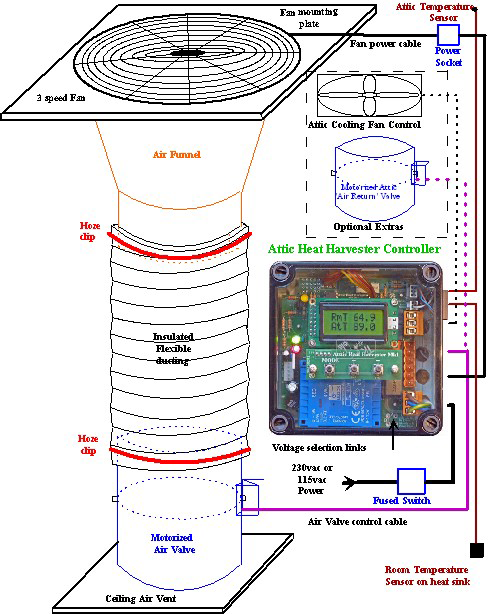 The solar heat harvester room temperature sensor is generally located in the room that receives the hot air near to the controller and approximately 1m from the floor, you may have to make small channels in walls etc to hide the cable. Alternatively you can use self-adhesive mini trunking. 13. Make holes in the walls if gravity air vent(s) and fixed air louvres are needed, and fit them ensuring that the gravity vents are on the air exit side. 14. We recommend that the Attic Heat Harvester power be fed via a separate fused (2 or 3 amp) isolating switch which is generally mounted beneath or beside the controller. 15. Carefully remove the front of the Attic Heat Harvester controller by loosening the four black corner screws. 16. Move the front panel forward enough to carefully disconnect the 4 way keypad connector from the front panel by wiggling it side to side and put the front panel aside. 17. The Attic Heat Harvester Controller user connections are on the right hand side inside the enclosure – see the picture above. 18. Mark and make four mounting holes spaced 95mm apart in the wall for raw plugs to mount the controller, and make holes in the wall for the fused power switch and wires. 19. Connect the controller cables as shown in the wiring diagram above and fit the controller and fused power switch to the wall. 20. Carefully check all system connections to ensure they comply with the wiring diagram. 1 Initial commissioning can be done without the front panel keyboard being fitted. 2 Temporarily disconnect the 6 way controller connector J8 for the initial tests. 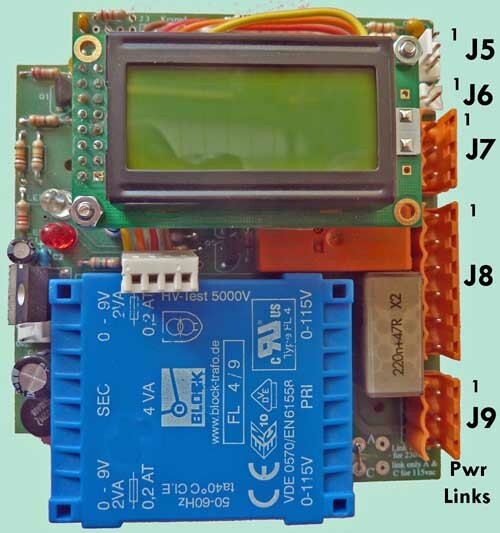 Only the attic temperature sensor J5, room temperature sensor J6, and main power connector J9, should be connected – see the picture at the beginning of this webpage. 3 Turn on the power to the Attic Heat Harvester controller. 4 If the controller is connected correctly the green Power On LED should turn on, the display back light will turn on for 1 minute and the yellow LED (top left) should blink every second. The LCD display will sequentially display a 'Sign On' message, and the 'firmware version number'. The controller then performs a self-test displaying any problems seen. 5 If problems are detected with the 230vac supply voltage or with the temperature sensors they will be displayed and you should consult the Attic Heat Harvester Controller Manual, section 4 Systems Tests for help. To select the controller 'built in test features' the front panel keypad will need to be connected. Problems need to be rectified before you can proceed to the next step. 6 If there are no problems the Current Time will be displayed as 0:00 and give you the option of setting the time using the + and – keys. This process will be ended in a few seconds or can be aborted by pressing the front panel Mode key, then the attic and room temperatures will be displayed. 7 Turn OFF power to the system. 8 Connect the 6 way connector J8 that supplies power to the air valve(s) and to the Attic Fan / Blower. 9 Carefully refit the front panel by connecting the 4 way connector ensuring that the yellow wire is at the left side. 10 Turn ON power to the system. 11 When room temperature, attic temperature, and system parameter settings permit the air valve will be opened. After a 30 second delay that permits the air valve to fully open the attic fan / blower will turn on. The Attic Heat Harvester Controller has many 'user set' parameters that enable you to configure the system to suit your installation and your needs. See section 3 Parameter Setting Mode. The Attic Heat Harvester Controller continually monitors your systems performance, See section 2 System Performance Display mode. Enjoy your Solar Heat Harvesting System and the heating cost savings you will have, please tell others about it. Thank you for helping future generations of mankind by reducing your carbon foot print. To get the best from you system we suggest you read and become familiar with the Attic Heat Harvester Controller Manual.